2017 was a major year for cryptocurrencies not only because of the price boom at the end of the year, but also of its increasing popularity. More and more companies are including cryptocurrency payments into their payment systems. One of the many companies which are considering cryptocurrency payments is online retailer Amazon. In Amazon, you can purchase a wide variety of items so accepting cryptocurrency as payment would give consumers more choice of payment. Only time will tell if cryptocurrencies will take over cash or card payments and we have to be ready for that when it happens. Not everyone is a cryptocurrency expert and some of us are just beginners who want to learn more about cryptocurrencies. Fortunately, there is an app called Bitcoin Flip Coin Market game that helps beginners to grasp the basics of cryptocurrencies. Bitcoin Flip allows beginners to progress on their crypto journey step by step. The crypto game introduces users to cryptocurrencies like Bitcoin, Ethereum, Litecoin, Dashcoin, Monero and Ripple. The newest cryptocurrencies added to the trading simulator are Stellar, IOTA, Bitcoin Cash, Cardano, NEM, NEO, NANO, ZCASH, Tron, Vechain, STEEM & DodgeCoin. The main aim of the crypto trading app is to allow users to have a similar experience in a real market and to create their own unique trading strategy. Every trader can test their trading strategy in the simulation mode with no risk and no real money involved. Every user receives a deposit of $5000 virtual money. The app follows the real market price movement 24/7. Bitcoin Flip is infused with good visual elements that help traders break down market and price movements in a fun and exciting way. Customize your graphs by choosing linear or candle stick charts to monitor market fluctuations. The app also provides a fun and competitive environment. Connect your Facebook account and battle with them head to head. Bitcoin Flip provides the opportunity to compete with your friends and other traders from around the world as well. The app allows you to monitor your trading success on leaderboard too. When you feel more confident in your trading capabilities, the app provides you with a Top Brokers list for you to enter the real markets. The brokers list consists of well-known brokers like Etoro, iq option and Coinbase. The app is catered towards beginners however a lot of our current users are professional traders that enjoy the app as well. Bitcoin Flip also acts as a platform for users to develop or revamp their investment strategy. 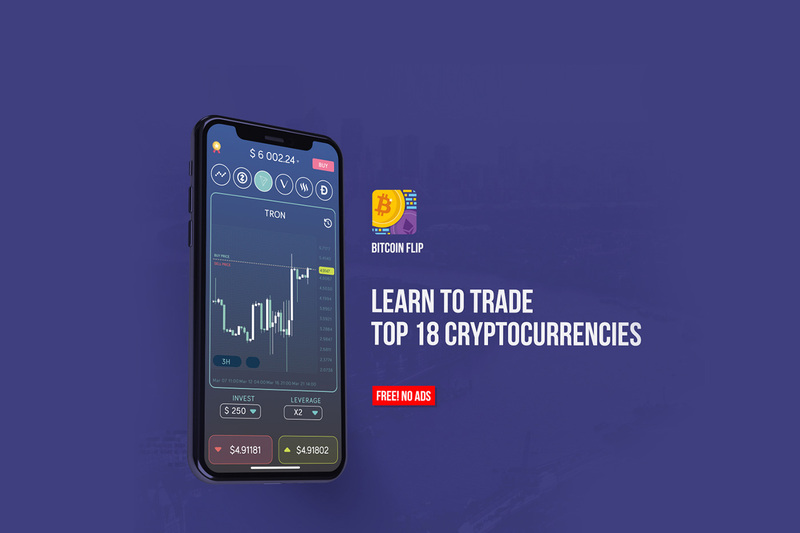 Be on top of the game with cryptocurrency trading with Bitcoin Flip Trading game and happy trading!